Leaving his home in St. Paul’s, where he was born, Prime Minister Douglas journeyed to the nearby St. Paul’s Primary School, where he was greeted by three students and the head teacher. In an informal setting, in the Assembly Hall, and with students seated near to him, Prime Minister Douglas spoke of his experience as a St. Paul’s Primary School students, his favourite classes, teachers and other people from the area that were his fellow students and of the teachers who inspired him. He used the opportunity to encourage students to make positive choices, about the effect of anti social behaviour on others and of the importance of staying fit and healthy and health issues. 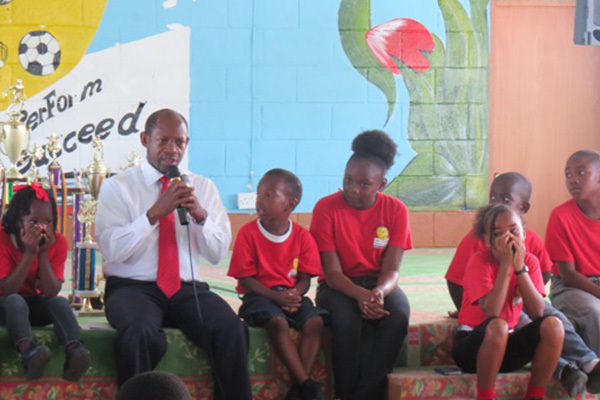 Prime Minister Douglas also spoke of his service to the community and the country and challenged the students as to how they can start serving even as this young age. Before leaving he presented a financial donation. From the St. Paul’s school, Prime Minister Douglas went to the Verchild’s High School where he launched the Edunet Service. He told the ceremony that the St. Kitts-Nevis Labour Party is committed to using existing technology to improve the ease with which teachers, students, and all those involved in the Federation’s public secondary schools access and share information. “We wanted students and/or teachers at any of the Federation’s high schools to be able to teleconference with students, teachers, or special guests at any of the other high schools, at any time. We wanted to ensure that internet access and connectivity would not be limited to specific rooms or specific buildings at one high school or another, but that at any point at any of our high schools, and extending 100 feet outward, access and connectivity would be maintained,” said Prime Minister Douglas. He said that the Edunet download and upload speed will be faster than that of the average residential customer. “At the same time we understand the importance of constructive and appropriate computer use, and so we have been certain to put in place very specific blocks,” said Prime Minister Douglas. Arriving at Government Headquarters after mid-day, Prime Minister Douglas was greeted with tumultuous applause by civil servants from the several ministries housed in the building. Dr. Douglas was personally greeted with hugs, kisses and words of encouragement and expressions of full confidence.